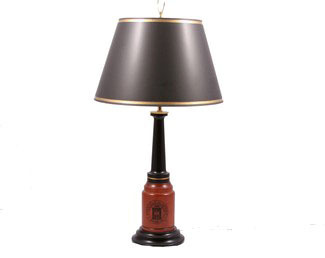 The Heritage Lamp from Standard Chair will compliment your Deerfield Chair or stand alone as a classic gift for your graduate or alum. 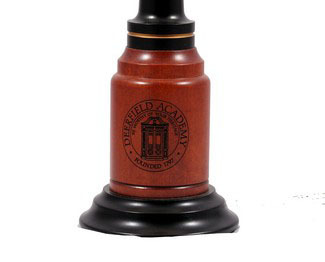 Made of solid maple hardwoods, laser engraved with the Deerfield seal and hand painted gold trim. 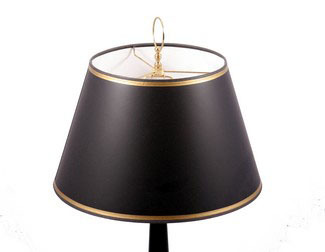 The shade is made of black parchment with gold trim. 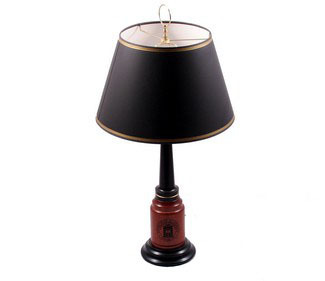 Each lamp has a unique two-way setting mechanism that allows you to set it at either regular light for reading, office work, etc. or an economy setting for a dimmer light that uses less electricity, and yet it takes standard light bulbs only. Comes with an 8 ft. cord. 27" h, 7 lbs. Minimal assembly: attach shade and screw on finial. Additional personalization is possible just below the seal or a brass plate can be attached to the back. Allow 3-5 weeks for delivery. Please call about rush options.